On January 8, President Donald Trump will make the most significant immigration decision of his first year in office: whether to deport the 200,000 Salvadorans in the US currently protected under the Temporary Protected Status (TPS). Established by President George H.W. Bush in 1990, the TPS program granted citizens from 20 countries work permits and legal residency should a catastrophe — such as a natural disaster, a war, a health epidemic, or domestic terrorism — render their hometowns uninhabitable. Salvadorans have been beneficiaries since 2001, when a 7.6-magnitude earthquake ravaged San Miguel, one of the country’s largest cities. Since its creation, the TPS has been renewed every 18 months by presidents from both parties. Trump reversed the trend this past November when he announced that he will boot 59,000 Haitians and 2,500 Nicaraguans from the program by 2019. Removing TPS protections from Salvadoran nationals would be the largest change in the program by far. Opponents of TPS argue that it was designed as a short-term response to specific humanitarian crises, and its provisions should expire once the immediate dangers from such calamities have subsided. But years after the earthquake, gang violence and homicide are still rampant in El Salvador, prompting immigration and human rights advocates to argue that the country is no safer now than it was at the turn of the century. Experts predict that terminating the program would be both economically and emotionally devastating. The sudden arrival in El Salvador of 200,000 TPS recipients, roughly 3 percent of the country’s population, could destabilize the economy. The economic consequences for the US would also be substantial. Should Trump repeal the TPS for immigrants from El Salvador, Honduras and Haiti, the US gross domestic product (GDP) is estimated to drop by $164 billion over the next decade. Contributions to Social Security and Medicare from payroll taxes would fall by $6.9 billion. In a letter to the White House, New York City’s Bill de Blasio and 18 other mayors — including those of Los Angeles, Chicago and Houston — demanded an extension of TPS for Salvadoran citizens who have cultivated deep roots in American society over the last two decades. 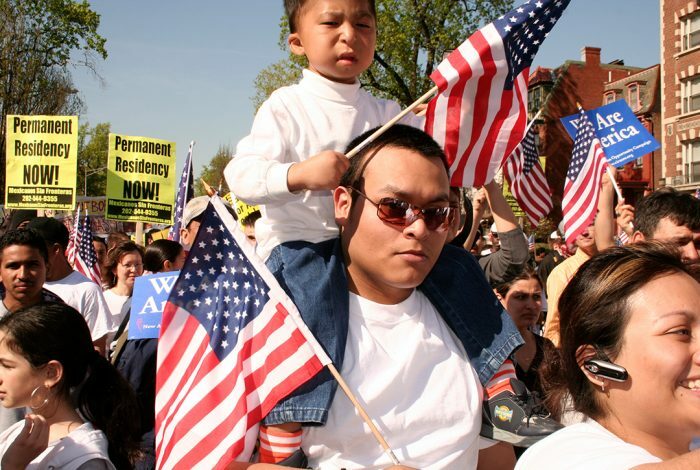 Roughly a third of the Salvadoran diaspora own homes, and two-thirds have at least one child born on American soil, according to a 2016 survey. Bishop Mark Seitz of El Paso implored Trump and the Department of Homeland Security to renew the program so that scores of families will not be forced to have to decide whether their American children will remain in the US or follow one of both parents to El Salvador. “How we treat the most vulnerable in our society is reflective of who we are and whether we have learned anything in the 2,000 years since the birth of another immigrant child, born in a stable because his parents could find no room for him at the inn — an event we have just celebrated,” he wrote in an op-ed for The Hill. In the video below, Salvadorans reckon with the threat of mass deportation. Related front page panorama photo credit: Adapted by WhoWhatWhy from visa (USCIS).